Traveling around the Italian countryside is one thing that I would recommend doing if finances permit. For this trip, we were driven around the countryside by a private coach bus driven by a really nice Italian man named Pasquale. This was surprisingly was very comfortable and it allowed me to see and photograph a part of Italy that I probably wouldn’t have been able to on my own in comfort and style. Benevento is city within the Campania region of Italy. Benevento is a beautiful and easily walkable city. There were many interesting site to see in the city, some of which included the Chiesa Hagia Sofia, The Arch of Trajan, the Roman Theater and the general architecture of the city. 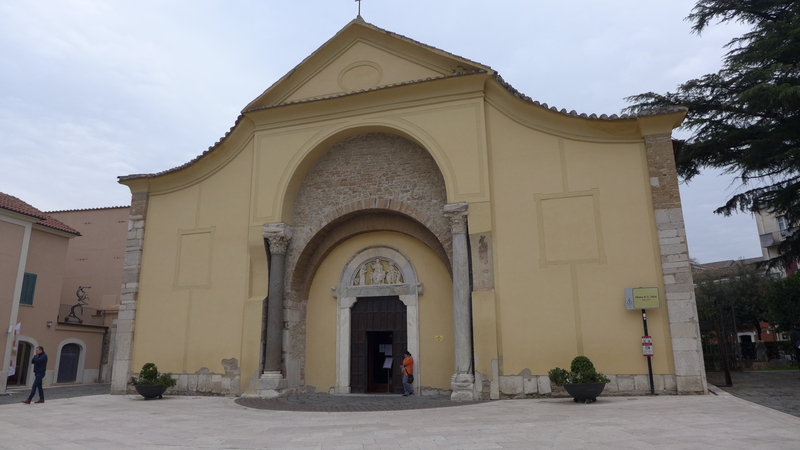 The Church of Saint Sofia, which was founded by Arechis II around 760 in Benevento, is one of the main surviving examples of Lombard architecture in Italy. The church was severely damaged by earthquakes in 1688 and 1702. In 1688, the bell tower, which was built by Abbot Gregory II was destroyed during the earthquake. The collapse of the tower, which at that time was much closer to the church, destroyed most the original structure. In 1703, the bell tower was rebuilt in view of church but at a much safer distance should another earthquake cause it to collapse again. In 1705, restoration of the church began and at this time it was rebuilt in the Baroque style with a circular plan, in lieu of the original stellar plan. During this time, most of the original frescos which decorated the interior were destroyed; the few remaining fragments today depict the stories of Christ and Mary. In 1957, most of the original appearance of church was restored based on evidence and historical documentation. In the interior center of the church there is a hexagon with six column connected by arches which supports the dome. The internal hexagon is surrounded by a decagonal (10 sided) ring with eight pillars in white limestone and two columns next to the entrance of the church. The central and frontal parts of the church form part of star, interrupted by the portal, with four niches in the corner. The exterior of the church is still in the baroque style. It was the only part of the church not restored to its original form. If you look carefully, you will find that part of the façade contains piece of roman ruins as part of its construction. Visiting this absolutely stunning church was one of the highlight of Benevento. It is the only church that I have visited that contained a decagon within a was hexagon in its interior. The fresco fragments and the use of Roman ruins during the rebuilding of the church was also very interesting. 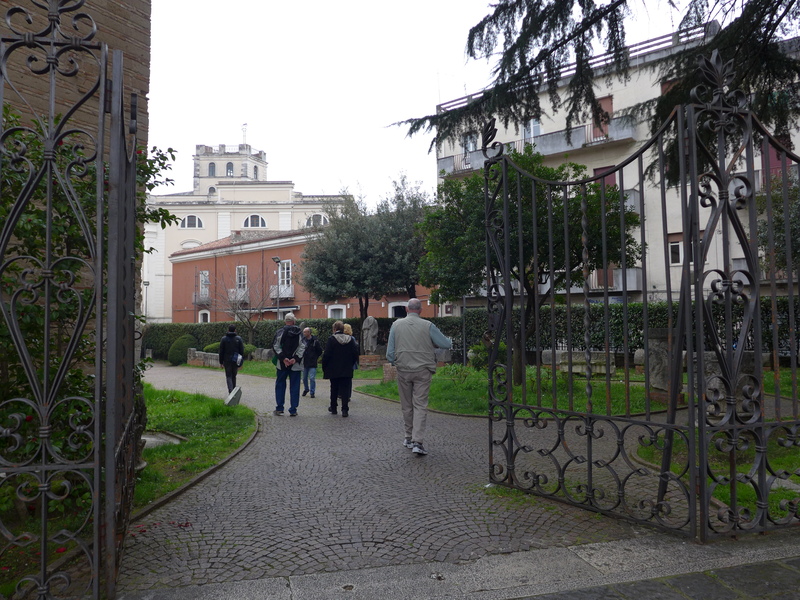 Next to the Chiesa Hagia Sofia, there is a gated entrance to the Museo del Sannio. The museum was founded in 1873 by the Provincial Council of Benevento. It was constructed to house the archaeological findings from the area. Although we did not visit the museum, we were able to see some of the museums ancient Roman collection in the garden space leading to the Hagia Sofia cloister. The Hagia Sofia cloister, constructed in part of fragments of earlier buildings, is from the 12th century. The cloister consists of wide arches that sit on pillars between which there are of four lights with horseshoe arches with the exception of one section, which only has 3 arches. Within the columns supporting the arches, there are two that stand out from the rest: one is a column with a knot, which symbolizes the holy trinity (agape “love) and one column which is a twisted column, which symbolizes the love between a man and a woman. After Hagia Sofia, we made our way to the Arco di Traiano (Arch of Trajan). Due to the heavy rain and the fact that we left our umbrellas on the bus, we initially stopped under an umbrella outside a cafe about 50 feet away from the Arch. Here we learned about some of the history of the Arch. The Arch of Trajan is an ancient Roman triumphal arch which was built between 114 and 117. The arch is made of limestone covered by marble slabs. It was erected to celebrate Emperor Trajan across the Via Appia, at the entrance in the city. The Arch is richly decorated with each panel telling a story about Trajan’s influence in the city. Instead of viewing the Arch at this moment, my travel buddy and I ate lunch at Dionisio. For lunch, my friend Wing and I ate at the cafe we stopped at to get out of the rain. I had the lasagna con ricotta, bascilico e pomodoro (lasagna with ricotta, basil and tomato)and my friend had the salmone affumicato e flor di latte di pezzata rossa (salmon and smoked mozzarella). We both order a cioccolata calda, which had the consistency of a thick sipping chocolate. This meal was truly amazing. Upon my first bite of lasagna, my thoughts were, “Mmm. Mmmm. Mmmmm.” The noodles were fresh, thin and delicate; this lasagna melted in my mouth. The salmon was perfectly paired with the smoked mozzarella. The hot chocolate was thick and yummy. You know you are experiencing something is really great when you hum after taking your first bite and no matter how much you eat, you’re just happy inside and you know your heart is smiling. This was literally how I felt eating this meal. 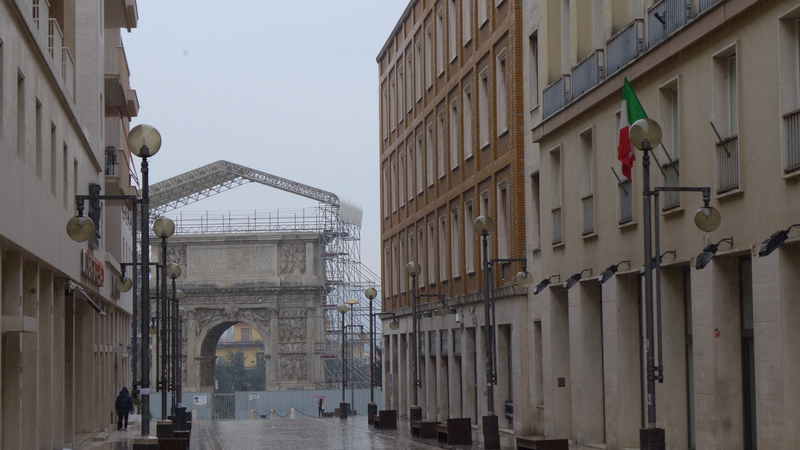 After our wonderful lunch, the rain had stopped and we took a closer look at the Arch of Trajan. All I could do upon closer inspection of this treasure was marvel at the craftsmanship of the builders of this ancient wonder. 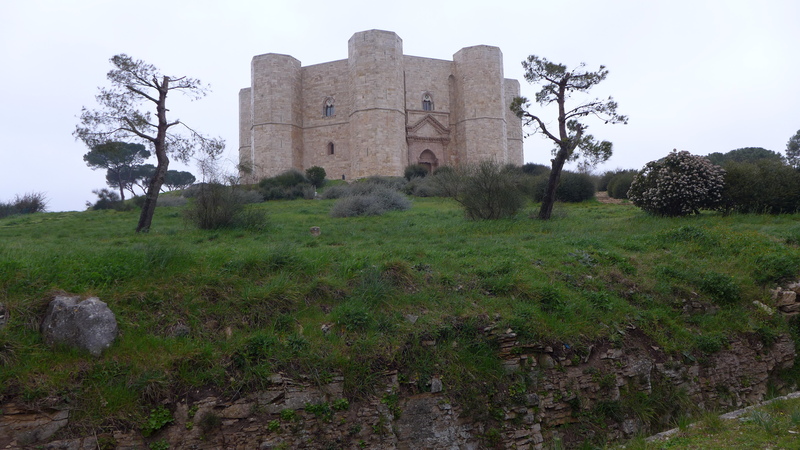 The Castel Del Monte (Castle of the Mountain) is a 13th-century bastion and castle near the town of Andria. It was commissioned during the 13th century by the Emperor Frederic II, who inherited the lands from his mother. The Castel is a two story octagonal prism with an octagonal tower at each corner. Both floors have eight rooms and an eight-sided courtyard occupies the castle’s center. Each of the main rooms have vaulted ceilings. Three of the corner towers contain staircases. That is was a good place for falconry, a sport of which was loved by Frederic II. When the Castel was built it was surrounded by fertile forest land that was good for hunting. That it was built as a spa for his wives, 2 of whom are buried in the Andria. It was believed that Frederic had 3-4 wives during his lifetime and his most favored wife came from the closets town to the Castel, Andria. It was also speculated that throne in which Frederic II would have sat placed his back in the direction of Andria; this symbolized that he trusted the people in the city because of his most loved wife was from there. That is was built a military outpost to protect the fertile lands of southern Italy. The person controlling the Castel could see in any direction because the castle was built on the highest point in a relatively flat area and the architecture of it made it hard for an invading army to overpower the entrenched army (the staircases are a prime example of this; it would be impossible for an encroaching army make it’s way to the throne room on the second floor by overpowering soldiers in the narrow winding staircases). On the day that we visited the Castle, the sky was overcast and it was surrounded by fog. This in no way distracted for the magnificence of this structure. The weather actually help to make this visit majestic and magical. It almost felt like we were transported back in time to the 13th century where the only visible structure was the Castel. This is a must visit location if you are in Benevento. Dinner was at Il Brigantino, a restaurant that was in walking distance to our hotel, the Nicotel hotel. This meal was included in our tour package. The meal was served family style and consisted of a starter of Foglie d’Oliva (Olive Leaf) pasta with clams and mussels, sliced pork loin with a side salad and desert which included gelato, a small piece of cake with a hint of alcohol and fresh fruit. Also included with the meal was red and white wine. Although I am not a fan of clams or mussels, the sauce on the pasta was absolutely delish. The pork was a little overcooked, but again, the sauce on it was just wow-inducing. The star of this meal was the desert; the ice cream was yummy and the tiny piece of cake was stellar. The sites seen on this day were some of my favorites. The beauty of the Chiesa Hagia Sofia, the mastery of the men who carved the Arco di Traiano, and the majesty of the Castle del Monte will always inspire found memories of my first trip to Italy.